PrintUK.com were featured on the BBC World News, Talking Business Programme where “BBC presenters, based in the world's most dynamic cities, discuss with the most important and influential people from the world of business and finance, the key issues of the day” On this programme we discussed how the Xerox paperless office has never come to fruition. We have examined some key questions surrounding the print industry and the use of printed products in today’s world. Has the death of the paper industry proved premature? 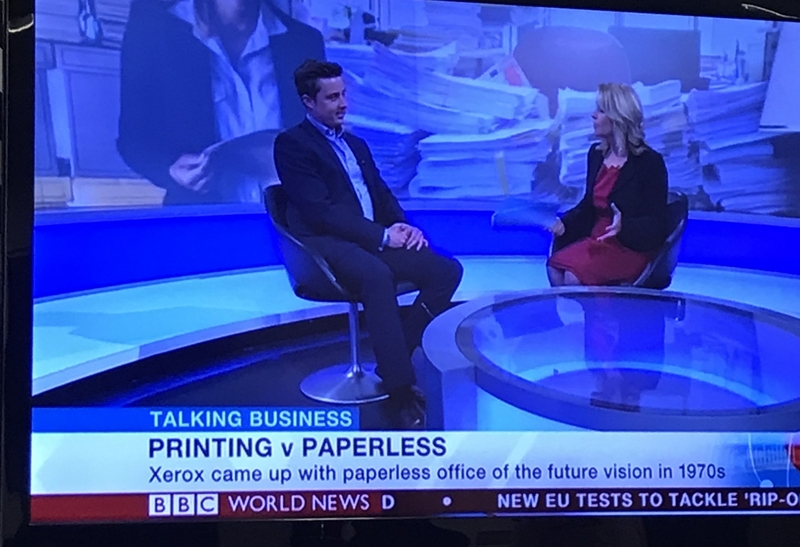 Yes, the paperless office never came to fruition, people typically want to see, feel and hold something tactile, it’s viewed as being far more trustworthy than its digital counterparts for example an email. Paper and print has longevity and authority, it’s almost impossible to imagine a world without print. It’s all around us and plays a vital role in the marketing mix. Where does demand come from? Do some countries use paper more than others? The biggest printing and paper demand comes from the USA $200bn value of printing output, followed swiftly by China with ($150bn). The UK is the world’s fifth largest producer of printed products with a $50bn value of printing output. The printing industry is ever evolving as is the marketing and advertising industry. With advancements in technology, print has become far more accessible to businesses globally. Demand comes from all sectors especially retail whereby the use of personalised direct mail is incredibly influential as its estimated 75% of consumers will act upon direct mail immediately compared to only 45% who act upon an email. Large global retailers such as Ikea rely heavily on print magazines to bolster sales and reach stakeholders as it provides trust, validity and personality with the branding being in situ. Paper prices have risen significantly in the last year (pulp price $670 per tonne in December 2016 to $1030 per tonne now and rising.) due primarily to strong domestic demand, which highlights that print and paper isn’t dying. Are people still using business cards and are they relevant? Yes, business cards are very relevant and are an incredibly important vehicle in the world of business. Business cards are internationally recognised, being tangible and the physicality of a business card offers legitimacy, professionalism and helps facilitate networking. The handing out of a business card is arguably an expected production in the world of business and is a catalyst to building a relationship. Its estimated around 10 billion business cards are printed each year in the US. In Asia the business card is incredibly important in face to face meetings and business transactions. When in Japan for example a business card is always exchanged and should be done so with two hands this is sign of respect, cards are kept immaculate and are kept of display for the remainder of the interaction. If you are to turn up to a meeting without a business card it could do irreparable damage to the business and is a serious faux-pas. How do you create the perfect business card? Simplicity is key here. Creating the perfect business card does not need to be as complicated as it sounds. Remember the essentials, your logo, name (of course) and ensure your business branding is also included. Its important to ensure any fonts used are legible and can be read clearly. Paper stock and finish is also vital, a flimsy business card will quickly put negative connotations about your business and how you will conduct business transactions. Do people digitize business cards? Yes the business card can be digitised but it has not slowed the demand for the printed business card because you primarily lose the main factors of a business card and what it represents. A digital business card is highly impersonal in comparison, and when conducting business transactions especially those where there is a high monetary value, a digital business card does not show professionalism, value or trust of the person or business its representing and could therefore be detrimental. About the programme. Available: http://www.bbc.co.uk/programmes/articles/1jR7CCVnfg1Pb4JrFWXN4Lz/about-the-programme. Last accessed 25 April 2018. BPIF. (2017). Facts and Figures 2017 . Available: https://www.britishprint.com/industry-involvement/research/facts-and-figures/. Last accessed 25 April 2018 . Rosie Niblock. (2018). The Best Direct Mail vs Infographic - Powerful Facts. Available: https://www.proactive.marketing/direct-mail-vs-email/. Last accessed 25 April 2018 . Statistic Brain. (2017). Business Card Statistics . Available: https://www.statisticbrain.com/business-card-statistics/. Last accessed 24 April 2018 .